Bowser's Lovely Lift! is a Bowser minigame in Mario Party 7. It is the only minigame that is unlockable only in Solo Cruise, and the only minigame in this installment and the entire series where the option to turn off CPU minigames does not work. The object of the game is to make it to the 100th floor while avoiding Bowser, who attacks the player. To beat this game, the player must hit four Elevator Blocks, and the elevator goes up a number of floors based on the total roll. For example, on one turn, if the player rolls a "7", a "9", a "10", and a second "10", they advance to the 36th floor. The total number of floors a player can progress on one turn is 40. After the 50th floor, a Koopa Kid comes to make the minigame more difficult. Their attacks include shooting three fireballs, three missiles, and, when Koopa Kid appears, he may shoot a laser beam. The player automatically loses if any of the artillery weapons hits them. However in the Solo Cruise, the game tracks the floor the player lost on, and allows them (or the opponent) to resume the minigame from that point when they continue it upon returning to it later. The player wins if the 100th floor is reached, even if there are additional numbers remaining on the dice block. Rules – "Do whatever it takes to move the elevator to the 100th floor...but watch for Bowser's attacks!" Advice – "Hmmm... What do those 4 Dice Blocks do...?" Kessen! 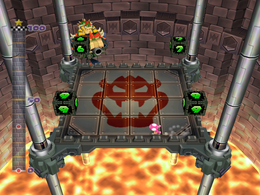 Kuppa Tawā Essentially "Showdown at Bowser Tower! ", with ｢決戦｣ kessen specifically meaning a "deciding battle". This page was last edited on January 24, 2018, at 23:38.